The current H1N1 swine flu strain has genetic roots in an illness that sickened pigs at the 1918 Cedar Rapids Swine Show in Iowa, report infectious disease experts at the University of Pittsburgh Graduate School of Public Health in the New England Journal of Medicine. Their paper, published online today and slated for the July 16 print issue, describes H1N1's nearly century-long and often convoluted journey, which may include the accidental resurrection of an extinct strain. "At the same time the 1918 flu pandemic was rapidly spreading among humans, pigs were hit with a respiratory illness that closely resembled symptoms seen in people," said senior author Donald S. Burke, M.D., dean, University of Pittsburgh Graduate School of Public Health. "Early experiments confirmed that this 1918 swine virus and a human strain emerged about the same time. 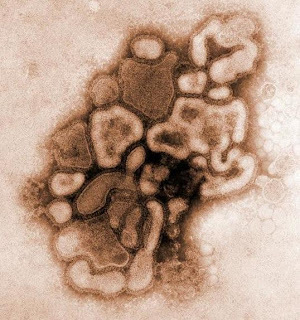 Since then, this ancestor virus has re-assorted genetically with other influenza strains at least four times, leading to the emergence of the new 2009 strain, which has retained some similarities to the original virus." In the paper, Dr. Burke and lead author Shanta M. Zimmer, M.D., assistant professor, University of Pittsburgh School of Medicine, describe the temporary "extinction" of the H1N1 virus from humans in 1957 and its subsequent re-emergence 20 years later. They note a small 230-person outbreak of H1N1 in 1976 among soldiers in Fort Dix, New Jersey that did not extend outside the military base. Then, H1N1 influenza re-emerged in 1977 among people in the former Soviet Union, Hong Kong and northeastern China. Careful study of the genetic origin of the 1977 strain showed that it was not the Fort Dix strain, but, surprisingly, was related closely to a 1950 human strain. Given the genetic similarity of these strains, re-emergence was likely due to an accidental release during laboratory studies of the 1950 strain that had been preserved as a 'freezer' virus, they said. The authors hypothesize that concerns about the Fort Dix outbreak stimulated a flurry of research on H1N1 viruses in 1976, which led to an accidental release and re-emergence of the previously extinct virus a year later. The re-emerged 1977 H1N1 strain has continued to circulate among humans as seasonal flu for the past 32 years. Although originally traced to Mexico, the exact physical origins of the 2009 H1N1 pandemic virus are unknown. Because the current strain shares common ancestry with older flu strains, it is possible that portions of the population may have partial immunity to the new pandemic virus. The authors also go on to explain that the danger posed by a virus isn't based solely on its lethality, but also on its transmissibility, which is the ability to jump from animals to humans and to survive by mutating to adapt to its new human host. H1N1 influenza viruses have demonstrated this ability throughout their history. "Studying the history of emergence and evolution of flu viruses doesn't provide us with a blueprint for the future, but it does reveal general patterns, and this kind of information is critical if we are to be as prepared as possible," said Dr. Burke. Stephen King's "The Stand" was published in 1978. I wonder if that '76 and '77 outbreak was the inspiration. unreflected sales enlargement of 13.6%, the wholesale conduit sales rise of 9.9%.